The Philadelphia 76ers have fired general manager Bryan Colangelo. Bryan Colangelo resigned as 76ers president of basketball operations and general manager on Thursday, ending a stunning nine-day saga that began when a website report tied him to damaging and anonymous Twitter accounts. Sixers managing partner Josh Harris announced the decision in a statement on Thursday. Head coach Brett Brown, fresh off navigating the franchise to its most successful season in nearly two decades, will serve as the interim general manager. The search for Colangelo's replacement will begin immediately, Harris said. Last week, the Sixers hired a law firm based in New York to investigate allegations first published by The Ringer, a sports and pop culture website. The firm announced its findings Thursday, concluding that Colangelo's wife, Barbara Bottini, was responsible for creating and posting from the anonymous accounts but that Colangelo was "the source of the sensitive, non-public, club-related information" the accounts shared. The statement further called Colangelo "careless and in some instances reckless" in safeguarding that information. "Ultimately, Bryan offered his resignation, realizing the detrimental way that these circumstances impacted our organization and his ability to do his job effectively," Harris said at an afternoon press conference held at the team's training complex in Camden. Colangelo was not on hand. Sources said his personal belongings were no longer in the office he had occupied at the complex. In a statement released by the Sixers on behalf of Colangelo, the now-former executive said he did not resign. Instead, the 53-year-old claimed he and the team "mutually agreed to part ways." He denied that his conduct "was in any way reckless." Thursday's decision to part ways brought a conclusion to a dramatic national story that had reporters, cyber sleuths, and die-hard NBA fans with social media savvy combing the internet for clues while frustrating an energetic base of Sixers fans who sat wondering how and when the saga would end. Late on May 29, The Ringer published a report that linked Colangelo to five anonymous Twitter accounts that shared sensitive team information and criticized the head coach as well as current and former Sixers players. Colangelo, responding to The Ringer's report, acknowledged owning one of the Twitter handles — @phila1234567 — but never tweeted from it, using it instead to monitor news and the industry. However, the report claimed Colangelo could be tied to four other accounts that did post controversial tweets. Colangelo denied any knowledge of those accounts. The Sixers announced the next morning that they had launched an independent investigation. The law firm that was hired — Paul, Weiss, Rifkind, Wharton & Garrison LLP — collected smart phones and tablets from Colangelo and Bottini and combed over text messages, email accounts and Twitter data, in addition to conducting interviews, in the course of its six-day search. The firm said in a statement Thursday that their investigation was limited and impeded by Bottini, who cleared her iPhone of evidence by doing a factory reset before she handed it over to investigators. But earlier this week, Bottini, 54, admitted she created and shared information on the accounts. >>READ MORE: What do we know about Barbara Bottini? Because of the destruction of evidence, Paul, Weiss couldn't conclude if Colangelo did know about Bottini's four secret accounts before The Ringer made the Sixers and Colangelo aware of them on May 22. In his Thursday statement, Colangelo shifted all of the blame to his wife. He said he never "purposefully" or "directly" shared sensitive, private, team-related information with his wife. "Her actions were a seriously misguided effort to publicly defend and support me," he said, "and while I recognize how inappropriate these actions were, she acted independently and without my knowledge or consent." Colangelo went on to say the content was "filled with inaccuracies and conjecture, which in no way represent my own views or opinions." The problem with his statement is that his wife's tweets aligned with some of the frustration and beliefs shared in the Sixers' organization. According to several sources, that's why several players thought Colangelo was linked to the accounts, even if he did not directly post from them — something he denied when the news broke. "I would say there's initially a lack of believing the story from people who heard it," Harris said of The Ringer piece. "As the story emerged … people understood the gravity, the severity of what was going on. … We realized the amount of information provided by The Ringer was credible and it wasn't just a made-up story." Now, it's Brown's job to lead the draft process and begin restoring credibility to the franchise. The Sixers are among the teams considered most likely to sign several prominent free agents, most notably superstar LeBron James. Free agency begins on July 1. James' Cavaliers are facing elimination in the NBA Finals Friday night. >>READ MORE: What's next for the Sixers? Brown admitted he might have to undo public-relations damage in order to repair the team's reputation and lure top free agents. "I feel most strongly that when we go into a place with some of my coaches, and you start bringing Joel Embiid and Ben Simmons in with me, that will be sufficient," he said of free agents wanting to play with the young duo. "In relation to are we going to have to put out fires along the way, you would assume that there could be teams that are competitive that we will try to take shots. I feel comfortable that we are equipped, that we are armed with the information and facts that we need to not let it be damaging." Harris used Brown's ability to lure free-agent shooting guard JJ Redick last season as an example of his recruiting skills. Redick signed a one-year deal for $23 million in July 2017. "People will always try to create uncertainty around their competitors," Harris said of teams also pursuing big-name free agents. "But I think a lot of my hope is first that [Brown is] going to be a great salesman for our franchise. And I'm hopeful that our players that are really committed in addition to being great basketball players and talented, but people that will help with the sales part. "We've got to attract the best in the league. I think from our point of view there was a relatively small number of people that we want. If we want them, we are going to have to convince them, because they're going to have a lot of opportunities." In addition to chasing James, the Sixers are interested in luring Oklahoma City Thunder forward Paul George in free agency, according to sources. 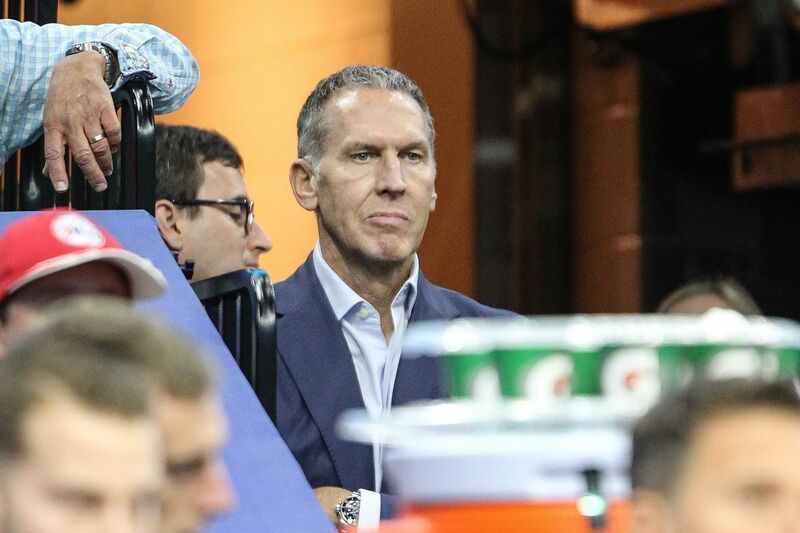 Harris and his co-managing partner David Blitzer were in charge of deciding Colangelo's future with the team, with input from CEO Scott O'Neil. The Sixers hired Colangelo on April 10, 2016. That was four days after Sam Hinkie resigned as general manager and president of basketball operations after it became clear he would lose his power to Colangelo. At the time of Colangelo's hiring, his father, Jerry, was the Sixers' chairman of basketball operations. Jerry Colangelo is in his final year as a team consultant. Bryan Colangelo worked for his father for 13 seasons with the Phoenix Suns before becoming the Toronto Raptors' president and general manager in February 2006. He ended his tenure as general manager in May 2013 and stepped down as president a month later. Paul, Weiss, Rifkind, Wharton & Garrison LLP was engaged by the ownership of the Philadelphia 76ers to conduct an investigation of issues arising from the publication of an article on May 29 identifying certain anonymous Twitter accounts that posted information concerning the club, its personnel and related topics. The article reported that the Twitter accounts may be connected in some way to Bryan Colangelo, the club's President of Basketball Operations. Our investigation revealed substantial evidence that Mr. Colangelo was the source of sensitive, non-public, club-related information contained in certain posts to the Twitter accounts. We believe that Mr. Colangelo was careless and in some instances reckless in failing to properly safeguard sensitive, non-public, club-related information in communications with individuals outside the 76ers organization.